With the Arbitration Act of 2006 Austria consolidates its emerging role as a seat for arbitration proceedings affecting Central and Eastern Europe. Based to a significant extent on the UNCITRAL Model Law, which is fast becoming an international stan-dard, Austria's new law is applicable in any proceedings involving parties from any country. 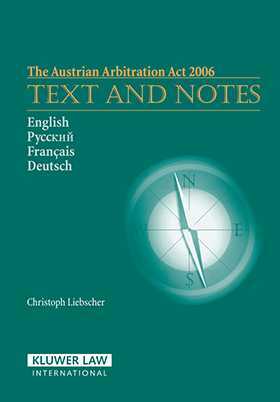 a wealth of general information useful for non-specialists who must advise on the drafting of arbitration agreements. This book will be of great practical value to arbitration practitioners, to international business people and their counsel, as well as to academics in arbitration and interna-tional trade law, especially in the context of Central and Eastern Europe.